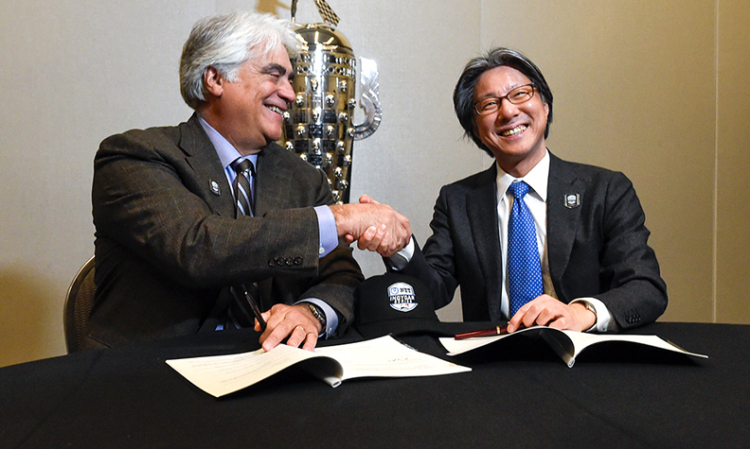 NTT, a $106 billion global information technology and communications company headquartered in Japan, signed a multiyear agreement with IndyCar for series title sponsorship and more. Mark Miles, president and CEO of Human & Company, owner of IndyCar and Indianapolis Motor Speedway, introduced global giant NTT at the North American International Auto Show as the series’ new title partner in a multiyear agreement. Tsunehisa Okuno, NTT executive vice president, head of global business, said, “The Indy car racing is getting more popular also in the Japan market, mainly thanks to the Japanese driver, Takuma Sato, who won the championship two years ago, the Indy 500,” Okuno said. “There was a special TV program in Japan, and I clearly remember during the program Mr. Sato, impressed us by saying that he saw something very special, very different after he became the champion of Indy 500. NTT will also be the official technology partner of IndyCar, the NTT IndyCar Series, Indianapolis Motor Speedway, the Indianapolis 500 and NASCAR’s Brickyard 400.